I need to start with a funny story from yesterday—I forgot to post it!!! We’ve been traveling on a bus that seats around 20 people. Yesterday morning as we were leaving the hotel (for our inaugural trip), all four of us that are representing US affiliates got on the bus. All the Habitat Haiti people were in the driveway. There was no driver on the bus, only a security guy in the very back. All of a sudden, the bus starts rolling backwards down the hotel’s driveway! It was quite a shock—and most of us were pretty much stuck in place! The security guy rushed forward and one of the drivers jumped onto the bus from the driveway and stopped it before it got very far. 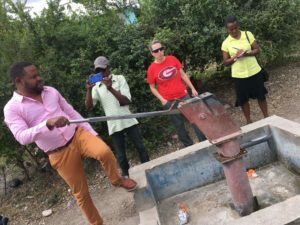 We teased all the Habitat Haiti folks—saying that it was our first experience on our tour!!! Perhaps that was a test of our nerves for the day! Today our very first stop was not too far from the hotel. It’s a picturesque view of houses that have been built almost all the way up the mountainside. 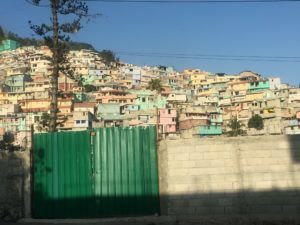 I understood that most of the homes on the mountainside were destroyed by the earthquake and the ensuing storms and mudslides. It’s amazing how quickly they have been replaced. 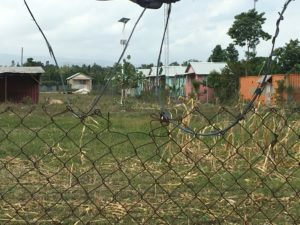 These are not Habitat homes—it shows some of the difficulty in housing here in the PAP area. 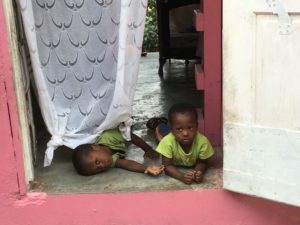 Afterwards, we drove to Leogane, which was the epicenter of the 2010 earthquake. The nearby community of Santo was the site of the Carter Work Project in 2011 & 2012. Habitat has built 350 homes in that community. We visited with a couple of the homeowners at their homes and then met with the Community Council. Each of the homeowners pictured below are thrilled with their homes, and each have added onto their homes. Jehoshophat is 61 years old and is the father of the twins also pictured below. 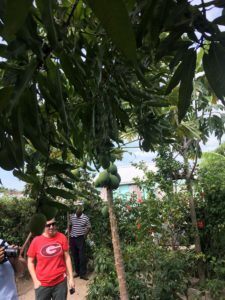 He is so proud of the fact that he has planted several fruit trees and has the best variety of mangoes available. 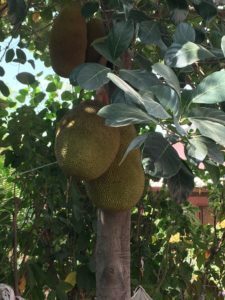 Unfortunately, they won’t ripen for another 6 weeks—I’m sure he would have shared them. 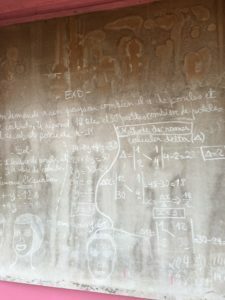 Again, we were exposed to math!!! 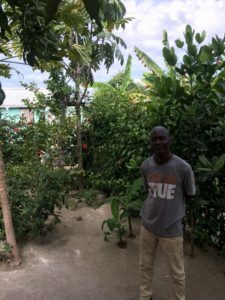 There is a chalkboard behind the addition to Jehoshophat’s home where his school-aged daughters work their math problems after school! Also pictured is a reminder of the Carter Work Project from 2012. 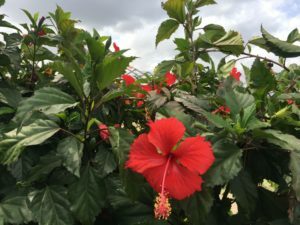 The flowers are so beautiful here–the extra sun helps with that! 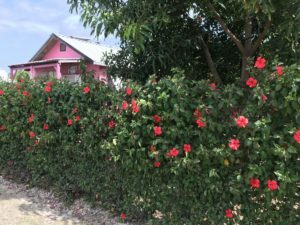 The homeowners in the Santo area were encouraged to plant fruit trees and many of the homes have beautiful hedges. 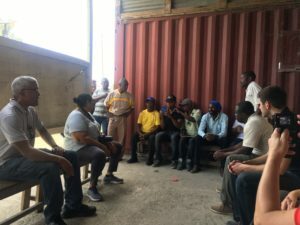 During the trip to Leogane, we heard from Alexandra, an attorney with Habitat Haiti, who is working to bring people together to deal with land tenure throughout the country. 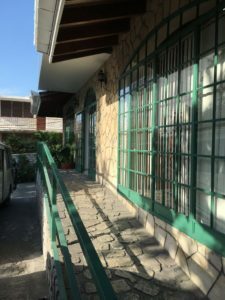 There is very little clear title to property in Haiti—and Habitat has facilitated some great work to educate people and make recommendations to the government on things that could be done to address this problem. 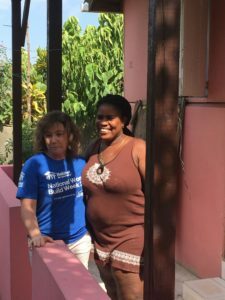 When we got back to PAP, we visited the national office of Habitat, where we learned about the work in southern Haiti from the national director, Tham. 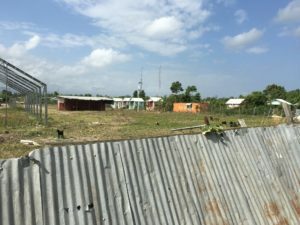 When Hurricane Matthew hit in 2016, it wiped out 200,000 homes in southern Haiti. In addition to that, it also wiped out agriculture in the area. Tham stated that the earthquake destroyed homes, but the hurricane took jobs away and destroyed the economy for that area. 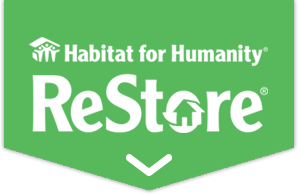 Habitat is addressing this by building homes that are resilient—to both earthquakes and hurricanes. The framing is able to withstand these threats. 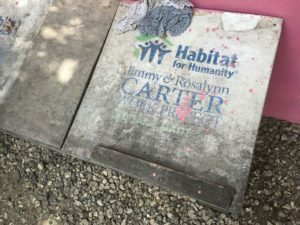 They are also working to train masons and the families who will be living in the homes to oversee the construction of the homes. Pictured below is the front of their office. After a bit of rest in the hotel, we went to a local restaurant. 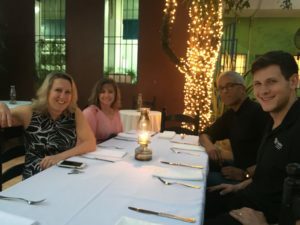 Pictured below are Natalie Nuce (Habitat Haiti, based in Atlanta), Kim Freeman (Rutherford County, NC), John Byrd, (East Bay-Silicon Valley, CA) and Luke Ferris (Grand Rapids, MI). They’ve been great companions on this trip!